Sonoita Creek flows through the Coronado National Forest, between the Santa Rita Mountains in the north and the Patagonia Mountains in the south, and is notable for its extensive, well preserved riparian corridor which harbors many rare species of plants and animals, especially birds. The creek creates a band of greenery in the otherwise arid mountains, in a transition zone between the Sonoran and Chihuahuan deserts, and which stretches for 15 miles, from the village of Patagonia to the low elevation foothills east of the Santa Cruz Valley, where the waters evaporate or seep below ground. 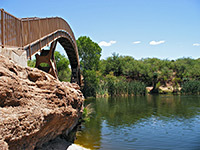 A dam over the creek (constructed in 1968) has formed the 265 acre, 2.5 mile long Patagonia Lake, now a state park, and one of the most popular recreation sites in southeast Arizona. The lake is a small but scenic reservoir, its blue waters surrounded by a narrow band of trees and bushes set beneath barren, rocky hillsides bearing cacti and yucca. The park is 11 miles northeast of Nogales, close to the border with Mexico. Below the dam, several miles of the creek and an area of hills on both sides are further protected as the Sonoita Creek State Natural Area. 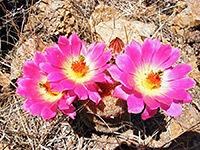 From state highway 82, a side road winds over dry desert hills covered with opuntia, barrel cacti and dead-looking grass, descending to the lake after 4 miles. In recent years quite a few new houses have been built close to the road, most enjoying majestic views over the mountains, the desert and towards the Santa Cruz Valley in the west. Entry to the state park (2019) is rather expensive at $15 per vehicle on weekdays, $20 at weekends. 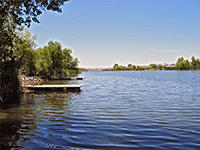 By the lakeside are a 106 site campground, marina, visitor center, shop, beach and picnic area with tables and bbq grills. Boating, camping, birdwatching and fishing are the main attractions; the beaches are rather small and tend to have litter, while the water is muddy, so this isn't a particularly good place for sunbathing or swimming. Hiking is not really an option either since there are no official trails and the hills to the west are steep and overgrown near the water, and filled with spiky plants higher up, making it difficult to walk further along the shoreline. Short paths do run along the developed parts of the lakeside, including one over a graceful, arched bridge spanning the marina inlet. The nicest part of the lake is the north side, reachable only by boat, as this has much less undergrowth, clean, flat rocks at the waters edge and more sandy beaches. A long, narrow inlet (Ash Canyon) provides many sheltered sites for fishing and mooring boats. West of Patagonia Lake dam, the Sonoita Creek State Area does have trails, about 20 miles in total, running alongside the stream and over the hills on the north side. The two closest towns with hotels near Patagonia Lake State Park are Nogales (11 miles southwest) and Sierra Vista (49 miles east).